Reference number for this case: 29-Oct-54-Bessèges. Thank you for including this reference number in any correspondence with me regarding this case. Yesterday Friday, at 8 p.m., Mr. Albert Rivière, radio-engineer, 28, street of the Republic, in Bessègues, returned from Molières-sur-Cèze by car with a friend, when, in the hamlet of Revesty [sic, Revety], his attention was drawn by a definitely visible gleam in the sky, in the direction of Malbosc. During half an hour the witnesses observed the phenomenon. The website indicates that on 27 September 1954 in Besseges, France, "An object was sighted by multiple independent witnesses that had an appearance and aerobatic performance beyond the capability of known earthly aircraft. Explanation: Planet." The sources are indicated as Guieu, Jimmy, Flying Saucers Come from Another World, Citadel, New York, 1956; Michel, Aime, Flying Saucers and the Straight-Line Mystery, S. G. Phillips, New York, 1958; Bowen, Charles, The Humanoids: FSR Special Edition No. 1, FSR, London, 1966; Vallee, Jacques, Computerized Catalog (N = 3073); Vallee, Jacques, Challenge to Science: The UFO Enigma, Henry Regnery, Chicago, 1966; Vallee, Jacques, Preliminary Catalog (N = 500), (in JVallee01); Schoenherr, Luis, Computerized Catalog (N = 3173); Rogerson, Peter, World-Wide Catalog of Type 1 Reports, Hatch, Larry; *U* computer database, Author, Redwood City, 2002. The website indicates that on 29 September 1954 at 20:00 in Besseges, France, "An unidentified object was sighted, but with appearance and behavior that most likely would have a conventional explanation. One object was observed by seven witnesses (Revesty)." The travel of the witness, from Molières-on-Cèze to Revety, is towards the North-West. 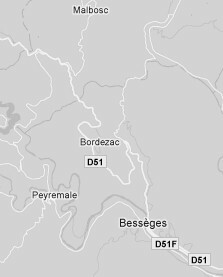 The decimal latitude of the town of Bessèges is 44.2833 and the decimal longitude of the town of Bessèges is 4.1, that is to say 44° 17' 30" Northern latitude and 04° 06' 02" of Eastern longitude. 0.1 Patrick Gross July 12, 2007 First published, [lp1]. 1.0 Patrick Gross February 18, 2010 Conversion from HTML to XHTML Strict. First formal version. Additions [ud1], [ud2]. 1.1 Patrick Gross October 30, 2011 A search on the web and in my documentation did not reveal other sources. The explanation was "Not looked for yet", this is changed.